DC Designers Dur Doux at NYFW — | The Style of D.C.
Najla and Cynthia Burt, the creative forces behind Dur Doux, a Washington, D.C.-based fashion line, debuted two collections at New York Fashion Week in September. They are no strangers to New York Fashion Week. Earlier this year, the alums of the DC Fashion Incubator from the DC Fashion Foundation, participated in Macy’s Red Dress Collection. But this time, they were presenting two different collections in their own show. Najla, left, and Cynthia Burt are the founders of Dur Doux. Dur Doux, which translates to hard, soft, held their NYFW show at Dreams on Air. The retail and public relations showroom is located in SoHo, Manhattan’s trendy shopping district. The duo showcased Amazonia, a ready to wear collection, and Red Carpet Dur Doux by Sonia Garbarino, a resort collection. 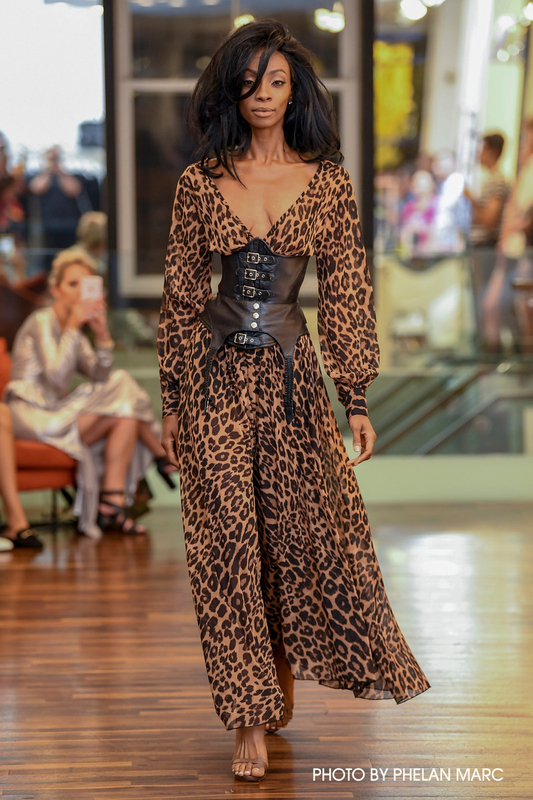 Amazonia, which can be worn during any season, has a contemporary look with animal prints as well as blacks and golds in an array of pants, dresses and skirts. A piece from Dur Doux’s Amazonia collection. Meanwhile, the resort collection “is an exploratory collaboration between Sonia Garbarino and Dur Doux,” they said. Garbarino is a designer who creates embellished formal wear. The mother-daughter duo describes the limited edition line as one-of-a kind designs for after-five occasions. Having their own NYFW show was something the pair has long wanted to do.